This week’s parsha is dedicated to seven of the ten makkos. These makkos, and the back-and-forth between Moshe and Pharaoh contain countless fundamental principles of the Torah. Yetzias Mitzrayim wasn’t just a practical undertaking of taking a group of slaves geographically out from Egypt. It was about making Klal Yisroel ready to become the chosen nation and be worthy of receiving the Torah at Har Sinai and experiencing the gilui shechinoh that would impact the rest of human history. This is the major goal of the ten makkos. They functioned as educational tools for Klal Yisroel and the entire world. But there was another goal. Not only does Hashem want to reveal Himself to Klal Yisroel and show them how He runs the world, but also that Pharaoh and the entire ancient world will come to understand the truth of Hashem’s absolute power. Hashem sends Moshe Rabbeinu on a mission—Moshe tries to fulfill it—to get Pharaoh to agree to release the Jewish people. But time and time again he is always spurred by Pharaoh’s intransigence. At one point, Moshe tries to bargain for a simple three-day furlough, pretending to promise to return to Egypt. Why this entire charade? Why all the false negotiations which try to hide the ultimate objective for Klal Yisroel? At one point, Pharaoh only agrees to let the men go. At another point, he agrees to everyone besides the sheep and cattle. But Moshe refuses to compromise. We are taking everything with us. This is the key point. We are going to serve Hashem and we don’t know what He will demand of us. We need to be prepared to give up everything. We aren’t really leaving slavery. We are exchanging one form of service for another. The idea of Klal Yisroel accepting the Torah is accepting a very all-encompassing form of slavery. The ten makkos begin and end in a very interesting way. The first of the makkos is when all water is turned to blood. The one before the last is darkness. Egypt had two major avodo zoros, because they get their sustenance and prosperity from two major sources—the Nile and the Sun. There is no rain in Egypt—all life is sustained by the water from the Nile and all plants grow from the power of the sun. By smiting the Nile and blocking the sun, Moshe Rabbeinu is teaching the Mitzrim that what you thought is the source of your existence and prosperity—a source of life—is really a source of death. Your avodo zoros are empty and powerless. Hashem controls the basis of your life. This is one of the key messages of the makkos—the destruction of all the avodo zoros. Hashem was not only out to show that He runs the world, but that all other powers are absolutely false. They aren’t even necessary as tools. Hashem can override them and render them irrelevant. The only avodo zoro that remained unaffected was Baal Tzefone. It was the avodo zoro of money. It was saved for last. The first thing Hashem does is show them that their source of life is a source of death. All the water in Egypt turns to blood. This is when the Mitzrim realize that the Nile is not their source of life. But then an amazing thing happens—the chartumim, the priests of the avodo zoro, have a desperate need to protect their belief system. They have to show everybody that Moshe’s G-d is not as impressive as He makes Himself to be. So they too turn water into blood! They have taken their own avodo zoro—which they were trying to defend—and also show that it is really a source of death! They don’t realize that they have been tricked into making a deep internal contradiction—all in a desperate effort to dismiss the makkoh. So why does Hashem allow the chartumim to perform the same makkoh? For two reasons. One, as we said—to set them up for failure and to illustrate the futility of worshipping the Nile. And the second makkoh also compounded this theme. The tzefardim which are going to cause such chaos and destruction are being brought up from the same Nile that they worship. The chartumim also bring up the tzefardim, but they can’t get rid of them. They can only cause destruction. Only Hashem can bring destruction and undo it in the next second. There are basically three stages of makkos. In last week’s parsha Hashem told Moshe that when he comes to Pharaoh, speak in the name of the deity of the Ivrim. But Moshe switches it to YKVK. Pharaoh responds that he doesn’t recognize YKVK. So Moshe reverts to what Hashem told him—G-d of the Ivrim has come to free His people-- and this is understood. What exactly is going on here? Pharaoh was able to acknowledge that each nation and each people has their own spiritual force that is in charge of their destiny. So he can understand that the spiritual power that is in charge of the Ivrim is claiming to release his people from Egypt. But Moshe Rabbeinu is telling Pharaoh that you aren’t getting the message. We aren’t talking about local deities and petty tribal religions. We’re talking about YKVK—the Ultimate Source of all reality. The Being who created everything and makes everything continue to exist. There is one Being that rules everything and He chose one people who He chose to represent Him in the world. This is something Pharaoh cannot relate to—it is outside his entire frame of reference. So Moshe shows that Hashem is not some local spiritual force—He turns the Nile into blood and a source of destruction. So Pharaoh goes back and says maybe your power is stronger than the Egyptian power. But it must be blind and subject to manipulation. So now comes the next level of makkos. They show Pharaoh and the world that Hashem is an independent and intelligent force that can make fine distinctions within the human world—choosing to bring suffering to one nation and spare another nation—within the same location. Then we have the last level of makkos before Makkas Bechoros. Hashem isn’t just an intelligent force. It is the greatest, most powerful intelligent force in the universe. But after Makkas Borod, why does Moshe continue repeating the theme? It is because these makkos have to penetrate deeply into the national consciousness of Klal Yisroel. It has to be told over from generation to generation for all time. It has to be part of our very identity as Jews. This is why there is a mitzvah of Sippur Yetzias Mitzrayim. So what is Makkas Choshech about? There are three purposes. 1) It is to knock out the power of the Sun—the final major avodo zoro of Egypt. 2) It is to allow Klal Yisroel to search the houses of the Mitzrim to be able to claim the riches Hashem promised Avrohom Ovinu when they leave. 3) And while everything that’s happened to show Klal Yisroel that Hashem is the only power and authority worth serving, 80% of Klal Yisroel are unable to make that adjustment and are incapable of leaving Egypt, so they have to be killed. We can understand how people get used to a certain lifestyle and belief system and they can’t see beyond what’s always been stable in their lives. The Jews of Germany had the same problem. Even after they went through Kristallnacht, many Jews brushed off Hitler as a passing blip on the radar. A temporary irrational phenomenon that would never take root in the high culture of the German people. They couldn’t accept a world that was going to turn everything upside down. This is what Moshe Rabbeinu told Pharaoh—we are leaving and we don’t know what we will encounter. There is no way to anticipate what will be demanded from us. This is the unbelievable emunoh of Klal Yisroel—they accepted whatever will come and put themselves in Hashem’s hands completely—without taking along provisions. But not everyone was capable of this level of trust. This was the first step in a year of education to make Klal Yisroel ready for the next level of naaseh venishmah. You have to be willing to be educated and absorb the lessons deep enough to put them into practice. You have to be strong enough in your new convictions to stand up to difficult nisyonos. Not everyone wanted to see the truth and re-orient themselves completely. Pharaoh was stubborn and didn’t want to change, and a large percentage of Klal Yisroel refused to be educated. So Klal Yisroel left Egypt and went straight into a midbor for a week with only the matzos baking on their backs. Imagine the deep level of emunoh this required. This was the first nisayon. Then they face the Yam Suf right in front of them, midbor all around, and Pharaoh’s army charging behind them. 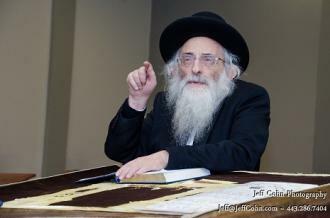 Moshe tells Klal Yisroel—just jump into the sea and Hashem will take care of everything! Another huge nisayon. This educational process took an entire year. Pharaoh, on the night of Makkas Bechoros gives us an incredible insight into human behavior. The Rambam in a letter describes the back-and-forth between Pharoah and Moshe Rabbeinu actually happened, but it is also a parable of the conflict between the yetzer horo and the yetzer tov. Imagine Pharaoh going through nine makkos where Moshe made prediction after prediction which came true. Moshe has proven himself over and over that he is a true novi—when he says something catastrophic will happen—it happens! But see what Pharaoh does on the night of Makkas Bechoros—after Moshe warned him directly that at midnight all the first born will perish. Rashi, on the posuk of “vayokom Pharaoh layloh” explains that Pharaoh got up from his bed. This is absolutely dumbfounding. After Pharaoh saw how Moshe laid waste to Egypt nine times and how he predicted it in advance, he heard Moshe predict Makkas Bechoros—where his own son will die—and he goes to sleep in his bed. Unfazed. Unmoved. Such is the power of cognitive dissonance. I can just block out anything that makes me uncomfortable and threatens my routine. Then, midnight strikes, the makkoh hits, and Pharaoh jumps out of bed and tells Moshe and Aharon to go out of Egypt and go worship YKVK. Finally, he capitulates to the truth. But then three days later, he starts to have remorse. Again, he refuses to fundamentally change the way he thinks and the way he functions. Until you get shaken up and turned upside down. Hashem is giving Klal Yisroel an entire year of education. They were no longer slaves—the slavery stopped during the year of the ten makkos. Hashem arranges that Klal Yisroel are mentally and emotionally free to absorb the lessons of the makkos to build them up and make them worthy of becoming the am hanivchar. Egypt didn’t recognize this and they were devastated. 80% of Klal Yisroel couldn’t take the message. It was too hard for them to change and adjust to the new reality. The Rambam says it didn’t just happen once. It happens in everyone's life. Everyone has their point where they refuse to accept the uncomfortable truth and prefer to live with fantasy. Everything will be fine just the way things are until reality comes crashing down. Pharaoh wakes up after Makkas Bechoros and realizes all the slaves are gone and their entire economy has collapsed. How are we going to survive without slave labor? How are we going to keep up our luxurious lifestyle? He gets six hundred chariots to pursue Klal Yisroel. Where did he get these horses from? He got them from the people who feared the dvar Hashem. But they didn’t really fear the dvar Hashem. They wanted to protect their property and fearing the dvar Hashem was the best way to do that. So when their economy was threatened by the dvar Hashem taking away their slaves, they didn’t care—they want their slaves back. If there is too much money at stake, they aren’t going to face the facts. This is what we find today—people who build their lives around money and lose their wealth in a market crash or a Ponzi scheme which collapses, are driven to suicide. Hashem is telling us there is more to life than material wealth and luxuries. Open your eyes and see how the world is being run by the yad Hashem. Many times in Jewish history the uncomfortable facts are staring Jews in the face, telling them they have gotten too comfortable in a particular country and a particular culture and they need to move on. But they refuse to see the looming danger and get caught in an illusion of security and stability. We teach our families every year the story of Yetzias Mitzrayim for two reasons. One reason is the idea that there is one force that runs the world –YKVK—and no other force in the universe controls anything. The second lesson is what the Rambam says—how Pharaoh’s stubbornness and self-delusion happens to all of us when we are confronted with uncomfortable facts. For four weeks we focus on the story of Yetzias Mitzrayim and it forms the background for the weeks of Shovevim. It is a time of teshuvoh. After three months since the yomim noraim, we need a refresher course in emunoh and the fundamentals of Torah. We were able to stand at Har Sinai and receive the Torah by giving up everything to Hashem and putting ourselves entirely in His hands. We are Hashem’s slaves. We didn’t get freedom from slavery—we simply exchanged one master for another. Go through these parshiyos and see how they speak to us in every aspect of our lives. We should not go through life stuck in our routine, oblivious to messages that Hashem is sending us on a regular basis.